Best Beach Bar in St. Pete Beach! 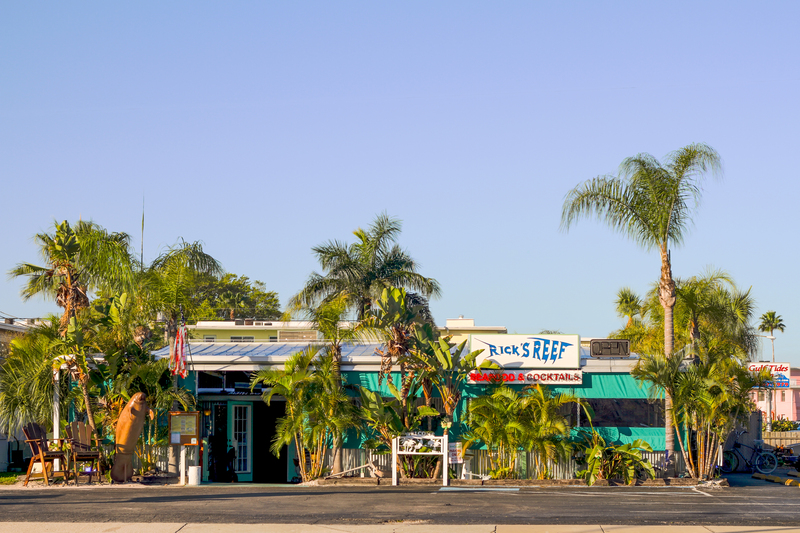 When you are looking for the Best Beach Bar in St. Pete Beach, don’t pass by Rick’s Reef! With its laid-back atmosphere, funky decorations and all around cool beach vibe you won’t find a better place to chill out. While it’s not right on the sand, it is just a couple of blocks from the Gulf of Mexico on Florida’s west coast. There is a full bar, fabulous food, bar games, indoor and outdoor seating and a very friendly staff! Chosen by “The Tampa Bay 100” as one of the three “Best Local Beach Bars,” you know you can count on a good time when you arrive at Rick’s Reef. Bring the Family, and don’t forget that all of our outdoor seating is pet-friendly! No one needs to feel left out! The following article appears on the St. Petersburg Foodies website. It was written by Lori Brown on April 25. Having lived on St Pete Beach many moons ago, I never would have thought of Rick’s Reef for food. I remember it as a friendly watering hole. We were contacted by the GM, Tyler Hipsley, who invited us in on Friday, April 13th for a meeting, so we decided to order lunch too. Hipsley took over managing Rick’s Reef in 2016 and has been working tirelessly to get the word out about the change in management and the major improvement in their food. There are very few places on St Pete Beach with a history like Rick’s Reef. It first opened as a drive-up hot dog stand called Larry’s Luncheonette in 1939. To this day, it still has the original floor. In the 1960’s it became The Capt. Zak Restaurant, then Spoonbills, Bobby’s Place, and The Reef. Several years ago The Reef closed. 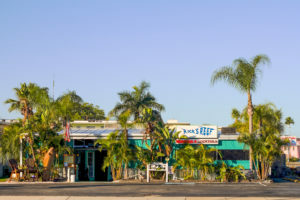 One of its regulars, Rick, not wanting to lose his favorite bar, decided to buy it, renovate it and re-open as Rick’s Reef in August 2012. The new owners decided to keep the name. They now tout Rick’s Reef as a place “Where old world Florida meets new world taste!” And they promote it as a “relaxing, enjoyable dining experience in a friendly, fun and family-oriented atmosphere”. The family part is very important. It’s not just a bar anymore. 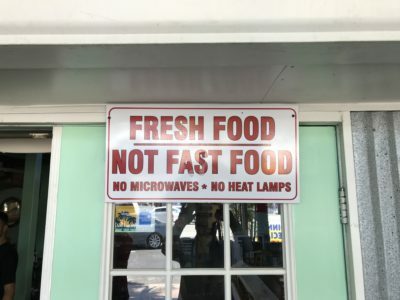 And the food is fresh, not frozen, with many items made in-house. When we arrived, I was quite surprised at how bright and welcoming the restaurant area feels. I remember The Reef as being very dark and dingy. Certainly not a place I would imagine bringing kids. How that has changed! It now has a terrific, upbeat vibe that any family would enjoy. Now onto the food. We decided to start with the Jalapeño Corn Fritters. These are served with shark sauce or Thai chili sauce. We chose to try both. I am not quite sure what I was expecting, apparently, the word fritter didn’t register with me, because in my mind I thought they would be more like a popper. 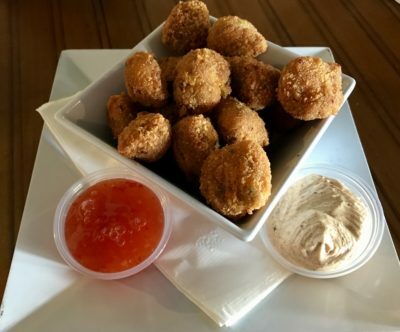 Instead, they were very similar to the consistency of a hush puppy. Still, they were tasty and there was quite a generous amount. I really liked the mix of the sweet (corn) with the spicy (jalapeño). When trying new places, we tend to order items that we both feel are benchmarks in our minds. 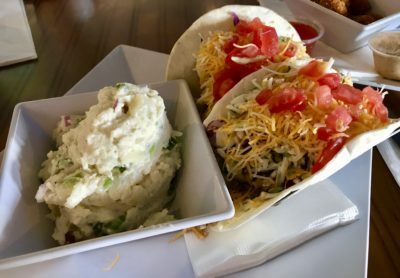 Kevin, loving tacos, ordered the Baja Tacos with a side of homemade potato salad. They are made with fresh Mahi-Mahi, grilled or blackened, and served in two flour tortillas with Baja sauce, a cabbage and cilantro mix, mixed cheese, and diced tomatoes. Not being a fan of tacos and because I can’t eat cilantro, I did not try these. Kevin described them as fresh (the taco shells and the fish), plump and juicy. He also said that the cabbage and cilantro mix matched well with the spicy, tangy Baja sauce. I am a major Philly Cheesesteak or French Dip, pretty much any kind of steak sandwich lover. So as soon as I saw The Big Dipper on the menu, I knew what was going into my belly. Our server, Jonah, also confirmed my choice. 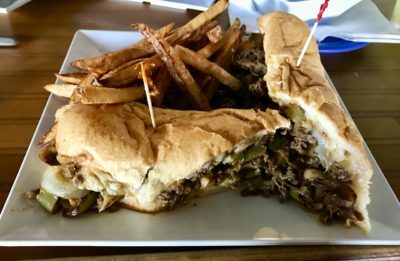 It is made with shaved rib-eye topped with provolone cheese and served on a lightly toasted hoagie with au jus for dipping. You can add grilled onions, peppers, or mushrooms for $.50 each, which I did. In the past ten years, I can name four places that I have had excellent, fresh steak sandwiches: The Tap Room at The Hollander (they have since changed it and it is no longer on my tops list), The Galley, Lenny’s in Clearwater and now Rick’s Reef. The bread was soft, fresh and lightly toasted and the meat was tender, sliced thin and just succulent. Not to mention the fresh, hand-cut fries which were impossibly addictive. We were so impressed with our lunch, and there was so much more that we wanted to try, that we ordered dinner to go. Kevin weighing in on the healthier side ordered the Fresh Salmon served with deep fried corn on the cob and a vegetable medley. 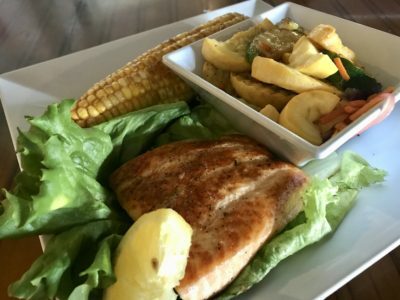 Every entree comes with a choice of two sides. That corn on the cob was soooo good: buttered, salted and deep fried. YUM! He said the Salmon was good but a little on the dry side. Then again, we did take it home and reheat it. Not the best choice for a re-heatable dinner. Kevin always says that whatever I order is always better. Typically we share everything but on this occasion, we just tasted each other’s. I chose the Mile High Meatloaf served stacked with homemade mashed potatoes in between and underneath and topped with onion rings and the aforementioned fantastic deep fried corn on the cob. Again, great meatloaf is hard to find, where it is not slathered in ketchup and not dry. 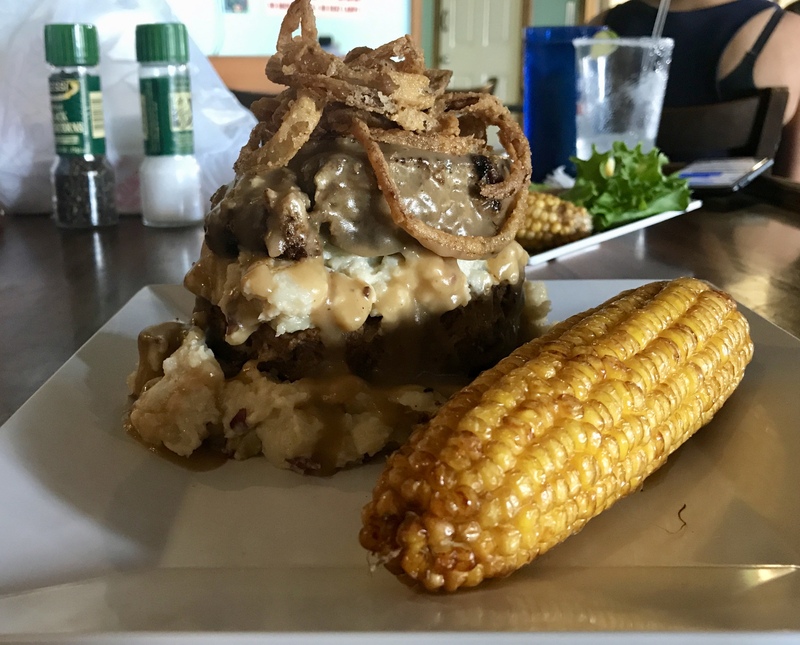 This meatloaf was sublime and now I have one other place, besides Callaloo, in which to get my fix. It was hearty, juicy and savory. The mashed potatoes had little chunks of potatoes and were creamy and satisfying. And the gravy had terrific flavor. Kevin snuck what was leftover later when I fell asleep. We really had no idea what to expect when we went to Rick’s Reef and had not even planned on writing this piece, but we enjoyed it so much that we definitely needed to share about this great surprise. **The entrees that we bought to take home we asked them to plate for picture purposes and then they packed them to go. Rick’s Reef was recently featured in the Island Reporter!